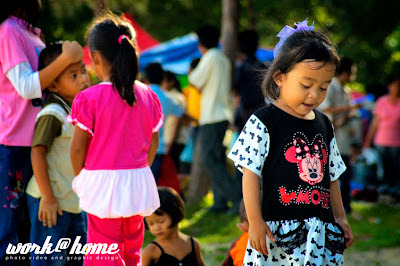 I saw lots of kids around the events. Most of them come from nearby the immigrant village. 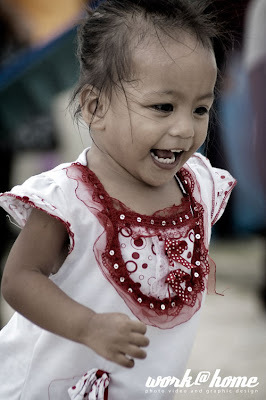 Lots of photo of kids was taken during that day because the expression they had that I find it very interesting. 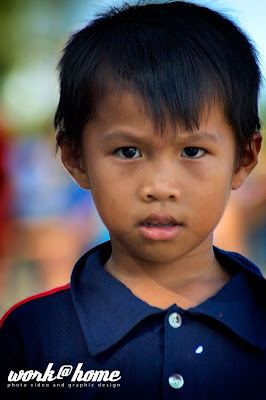 Most kid’s portrait has a very honest emotion. They don’t change the emotion but when as they knew that photo was taken on them, they will be shy. 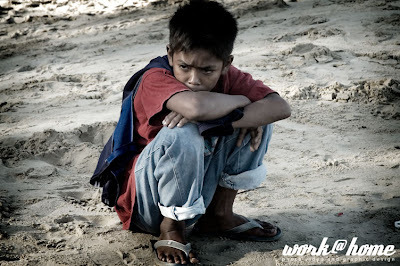 I spot this kids squat on the sand beach. I quickly snap and luckily the expression was good and deep. I wondered what this kid was thinking during that time. I changed to my telescopic lens. I need the long range lens to take the boat photo that very far away. At the same time it also helps me taking some close-up shot of the people. Most of the not aware me taking theirs photo because I was doing it candidly and was behind my friend. 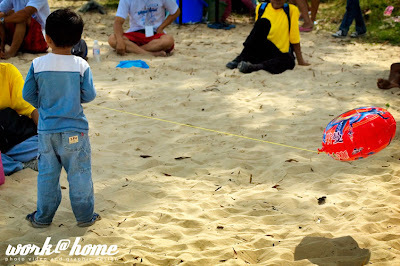 The photo above was taken as i saw this girl sweeping the sand that stick to her little brother’s face. I express the caring sister toward the family members that we often saw in a big family. This little girl portrait girl give me a very different emotion. It feels like she was abandoned by her friends that can be seen behind. The sharp focus to the girl and blur the other girl at the back gave a very high depth of field effect. 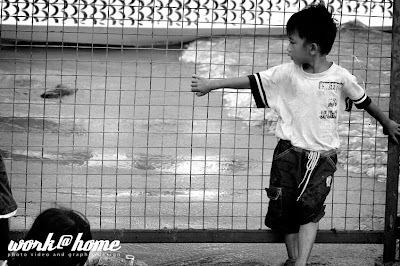 Chinese kids was not as playful as the others race. Most Chinese family lives in nuclear setting and not often exposed to a large crowd. 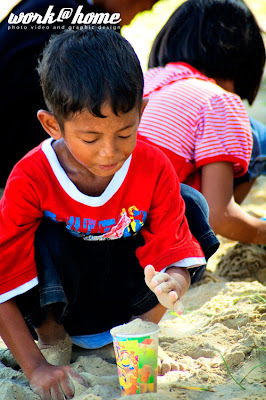 This boy was seen to play alone touching the sand. 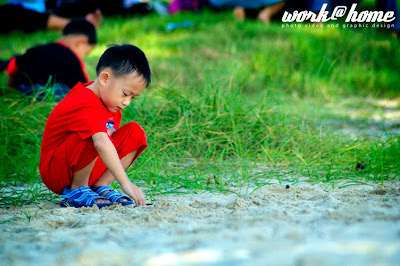 Most kids like to play sand and sometimes them just lying at the sand but this one just touching the sand. The telescopic lens gave me a very deep depth of field effect. It is because i set the focal point around f5 and I found out it gave me a bit problem when taking a shot of the dragon boat race. The problem with the telescopic lens i used was a manual lens. The auto focus was very slow and I can’t seem to get a sharp focus on the subject. Most of the moving subject was blurred and I only managed to salvaged few that I think worth to be posted. Being a kid is fun. They don’t have anything to think unless how to enjoy them self. 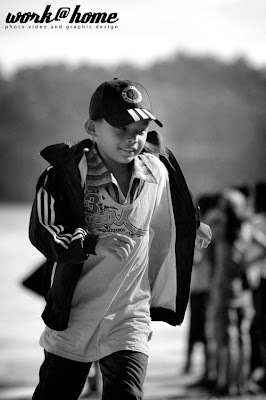 Beside the dragon boat race, kids do some other thing such as playing soccer to have fun. Some kids managed to join the group and some was isolated and ignored. 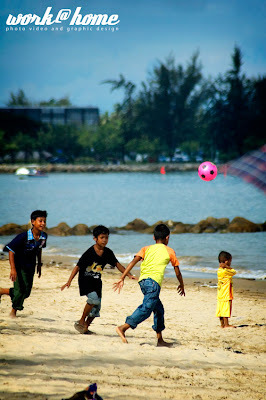 Nevertheless, they’re so fresh that nothing can stop them to have some good fun anywhere, anytime. This photo looks very intrigue. The balloon supposed to float up and not vertically. Maybe something was pulling the balloon to its position. Thou, the truth were the wind on the beach blowing so strong until the balloon on its position. After a few sessions, the rain started and luckily we’re on the way to go home.